Discover ways to help reduce stress during the often demanding holiday season. Find ways to secure the best Individualized Education Program (IEP) for your special needs child using these comprehensive guidelines. Learn how several of our regular contributors create meaningful together-time with their families during the holidays. Find out from an autism mom what you should do first when your child receives an autism spectrum disorder diagnosis. Learn how to identify the cause of headbanging in a child and how to reduce this self-injurious behavior. Discover top tips from an autism mom for building a stable foundation with your partner so your family can grow and flourish. An award-winning producer/director shares what he has learned while working on a film surrounding employment opportunities available for people on the autism spectrum. Learn strategies to help empower your student and improve a learning program by creating a climate of high expectations for all learners. Is Parenting Stressful? There's Help! Find out five ways to reduce stress for the long haul so that you can enjoy your life with your child. Learn what to consider when someone you know with autism enters the tween and teen years, as told by a young woman with Asperger's syndrome. Find out how dramatic play therapy can socially and emotionally benefit all children, especially those with special needs. Discover simple changes that can help you manage your often hectic and challenging world as a special needs parent. Find out how one Saturday writing group brings about kindness, tolerance, and forgiveness as they embrace gratitude. Take a look at Julie Hornok's new book, which offers families affected by autism understanding and comfort; includes a foreword by Dr. Temple Grandin. Learn how to incorporate well-priced products to create a sensory dream room. Discover the secrets for balancing your busy life as shared by a licensed therapist and grandmother of a young boy with autism. An author and motivational speaker interviews Celeste Viciere, LMHC, author and host of Celeste The Therapist podcast, and mother to a young boy with autism. own way and at his own pace. Author Aimee O’Connell skillfully weaves the story of Thorlak, sixth bishop of Skalholt, Iceland. Known for his autistic manner, he is the proclaimed Patron Saint of the Icelandic People. Find out from a financial advisor how to properly gift money to someone with special needs. How does the holiday season make you feel? Do you count down the days to celebration with utter glee—or do you just wish all the activities would end? Everyone is different - and every family has special needs and limitations. One child with autism may be thrilled to attend a holiday light spectacular, while another may be overwhelmed by the flashing lights and crowds. Some kids will be happy to visit extended family, while others will find the change in routine, sounds, smells, and food way too overpowering, triggering meltdowns. Finding peace while meeting the needs of every family member doesn’t always go hand in hand - and we want to help you. Take a peek at this month’s issue, and you’ll find excellent strategies and solutions to assist families in reducing stress and finding some peace. 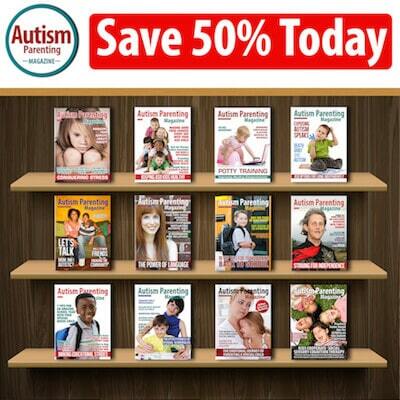 To commemorate the season, we rounded up several Autism Parenting Magazine writers and asked them to share their holiday memories. Take a look at The Special Ways Autism Families Celebrate the Holidays and learn how these wonderful families have found unique ways to celebrate while accommodating special needs. Stress and anxiety are major concerns this time of year. How does a child with autism handle it? Is it manageable along with parenting pressures? Author Nancy Peske, the mom of a young boy with sensory processing disorder and multiple developmental delays, has shared ways to reduce stress in her piece, Sensory Stress Busters During the Hectic Holiday Season. Her simple remedies include using mindfulness for self-calming and ways to reduce the sensory overload elements in life. Emily Daniels, MSW, RP, MEd, a psychotherapist and mom to a 10-year-old with autism, also has some reassuring words to share. Please read Is Parenting Stressful? There’s Help! as Emily lists five ideas to implement TODAY to set things in motion to reduce stress long-term so you can better enjoy the important moments. Despite all the best advice and counseling, special needs parenting can feel isolating at times. One of our regular writers, author Kimberly Reeves, MEd, has shared a thoughtful piece with us on ways to take care of yourself while caring for someone you love. Take a look at Finding Balance As a Special Needs Parent for advice on simple changes you can make to help manage an often hectic and challenging life as a special needs parent. As a single mom to a thriving young man on the autism spectrum, Kim’s advice is priceless. As a parenting magazine, we aim to consider all age groups when assigning content. Maybe a toddler just received an autism diagnosis, and you want basic advice, or perhaps a child is entering school and you want to understand his/her rights as a student, or perhaps a child is delving into the job market and you need guidance—we aspire to be your trusted resource. This month, we have covered all these topics. Take a look at the piece, After the Autism Diagnosis: What Should I Do? written by Calleen Petersen. In addition to a list of recommendations, Calleen provides a few tips on what she would have done differently in retrospect. What about the teen years? 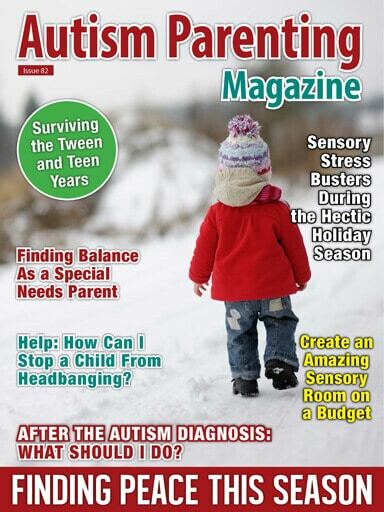 We have a special piece this month provided by Leanne Strong, a young woman with Asperger’s syndrome, called Top Advice on Surviving the Tween and Teen Years With Autism. As she explains in her article, the adolescent years don’t need to be feared, but rather, understood. Take a look at Leanne’s article as she provides excellent advice on how to help a person with autism during these typically tough years. Are you familiar with dramatic play therapy? According to studies, drama games can have direct, positive effects on children’s emotional control. Kate Foley, an author with a background in communication, education, and theater, believes drama can help children develop social skills, increase social perceptiveness, and encourage emotional regulation. Take a look at her piece Terrific Ways Theater Can Help Kids With Autism Communicate as she explains the benefits of dramatic play therapy, including the tremendous difference it made with her child with autism. This month we also have been given an insider’s view of a new documentary that follows the expansion of Spectrum Designs, a custom screen-printing and embroidery business located in New York with 75 percent of the employees being on the autism spectrum. Take a look at award-winning producer and director Stephen Mackey’s piece called New Hope: A Documentary Filmmaker’s Perspective on Peering Over the Cliff as he shares the best ways to help a child with special needs prepare for the workplace. As always, thank you for choosing to be a part of our extraordinary autism community. Send us an email if you are in search of assistance, and we will try to find you the latest information and professional advice.